His Excellency Prime Minister Sooronbay Jeenbekov, representing President Almazbek Atambayev, Patron of the University, praised the partnership between the Kyrgyz Government and the AKDN. Today in Naryn, surrounded by white snowy mountains, icy mountain peaks, we are celebrating an outstanding moment for us all in Kyrgyzstan. Today, we inaugurate a new international standard university in Central Asia. Dear guests, in the very beginning of my speech, I would like to say that the President of the Kyrgyz Republic Almazbek Atambayev shared his congratulatory message, which I would like to read out to you. If I may, I would like to read it in Russian language as we have an international audience here. Dear Ladies and Gentleman, Your Highness, Dear citizens of the Kyrgyz Republic! We celebrate a great occasion today which fills us with great pride and happiness. We officially mark the opening of the first campus of the first regional university in Central Asia in the city of Naryn. This is not an ordinary educational establishment, but an academic centre that will prepare the most skilled and innovative professionals for our country’s future development. We are happy that with the opening of the University of Central Asia, our youth will have more opportunities to receive high quality education of international standards and quality professional training. The University’s building with its bold architectural solution makes Naryn a more modern and beautiful city. This past quarter of a century after acquiring independence for the Kyrgyz Republic, we have accomplished new achievements in all areas of life, including education. The opening of the first campus of the University of Central Asia in Naryn transforms the city into a modern and beautiful city. It is an example of our joint achievements. Today, we consecutively improve our educational system. Kyrgyzstan is the only country in the CIS and around the world that allocates 24% of its budget for education. Of course, we are aware that in the educational establishment we have areas to be resolved. We want to prioritise making quality education accessible for everyone. The University of Central Asia admits students selected from across the region strictly based on their academic performance and leadership qualities. Thanks to the support of His Highness the Aga Khan, students from remote areas and small cities receive significant financial aid, based on their families’ needs, and no student was disqualified from study due to financial restraints. The Kyrgyz Republic constantly develops and maintains dialogue with the Aga Khan Development Network, based on trust, mutual respect, and social, economic and humanitarian cooperation. Last year’s meetings with His Highness the Aga Khan in Brussels and Bishkek have strengthened and have given additional impulse to the development of our mutual cooperation. I strongly emphasise that the Kyrgyz government is satisfied with the level and quality of cooperation with the Aga Khan Development Network, and is looking forward with optimism to its future development. Beginning September 2016, your education began, where you received knowledge and skills necessary to become future leaders in various disciplines. Kyrgyzstan is a special country with a unique role. Our strong state must be supported with professional human personnel. The future of our country is in the hands of our youth. Quality professional education must therefore facilitate the preparation of young people. I would like to express special gratitude to His Highness the Aga Khan, construction workers and employees of the Aga Khan Development Network, for their long-term vision. Once again, I would like to congratulate all Krygyz citizens and especially the residents of Naryn region and city of Naryn! We wish success to the University of Central Asia, peace and prosperity to our homeland. We are a nation that supports science and education. Education is not only our spiritual value but also a major resource for development. That is why the development of educational sphere is one of our government’s top priorities. Whether in mountainous or urban areas, providing citizens access to good education, healthcare and cultural systems has become one of our governments’ major tasks that we have been focused on. 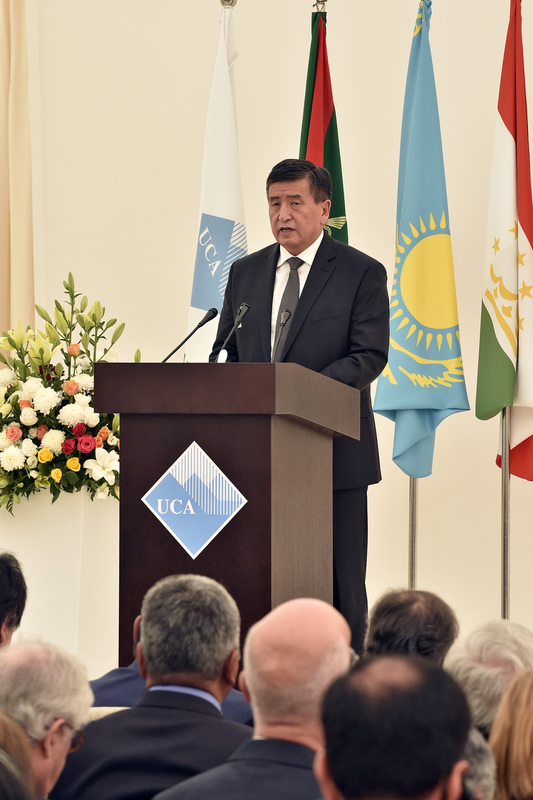 The inauguration of the University of Central Asia in Naryn has become one of the examples of our successful partnership with the Aga Khan Development Network. On your behalf, I would like to extend my deep gratitude and satisfaction to his Highness the Aga Khan and all the staff of the Aga Khan Development Network for making it happen. Your Highness, esteemed guests, fellow citizens. Education and training of high-quality international standards for young women and men who can contribute to the economic development of Kyrgyzstan, is one of our strongest desires. I wish all of you good health, prosperity and every success in your future endeavours. May God support us in whatever we do for the benefit of our country and our partnership.